I’ve been a LONG time fan of the fantastic Myron’s in New Braunfels (you can see our TV episode right here), and now that goodness is right here in San Antonio too. The Been family opened Myron’s Prime Steakhouse in New Braunfels back in 2003 in the beautiful 1920’s Palace Movie Theatre. Many of the old accents remain, like the ornate tin tile ceilings, the balcony and projection room where guests can dine. The New Braunfels location was so popular that the Beens opened a second location in the beautiful Alon Marketplace in San Antonio about seven years ago. In both locations, the steaks, the sides and the desserts are all delicious. 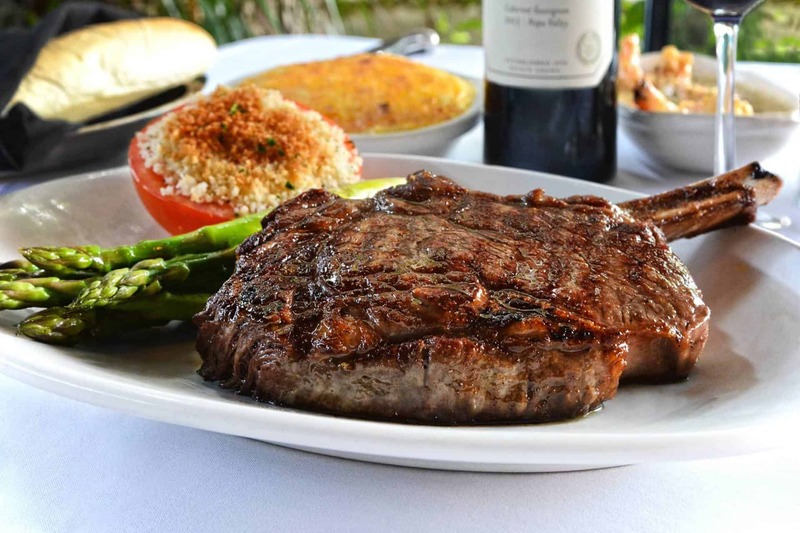 The Alamo City location is also the only locally owned and operated prime beef steakhouse in the area. The San Antonio location is modern and chic…a perfect location for celebrating special occasions, a romantic evening or enjoying a few glasses of wine with close friends. Myron’s at Alon also offer private rooms for business meetings, banquets and private parties making it a special space for the holidays! The star of the menu is, of course, the mouthwatering USDA Corn-fed Prime Beef, which is the top 2% of the nation’s total beef production. Here, the meat is of such high quality that all it requires is simple seasoning and a quick char on the in-house grills. The Bone-In Ribeye is one of Myron’s signatures. They also have many dishes for lovers of seafood and incredible side dishes, such as the super-popular Shrimp Myron. This spectacular bubbly and buttery appetizer is made with a blend of Myron’s signature spices, garlic, and fresh Gulf shrimp. Among the many other side dishes offered at Myron’s, the Jalapeño Mac & Cheese is a legendary stand out, composed of creamy cheese, blended with spicy jalapeños and Hatch Green Chilis and baked golden brown over shell pasta. Also, the Stuffed Tomatoes are baked beautifully and topped with Gorgonzola cheese and toasty breadcrumbs that are not to be missed. Join us at Myron’s for the Holidays!